How Do I Use Houzz For Living Room Inspiration Ideas? 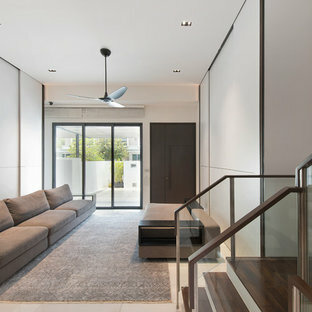 The living room is where most Singaporeans spend most of our day relaxing after a busy day. 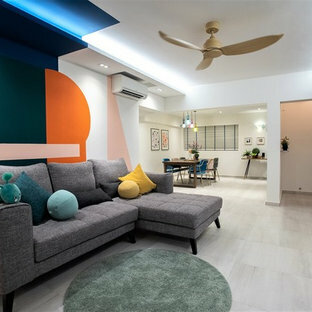 Whether you live in a 3-room BTO HDB flat or a semi-detached house, at the end of the literal work day, this space has to make you happy, not anyone else. 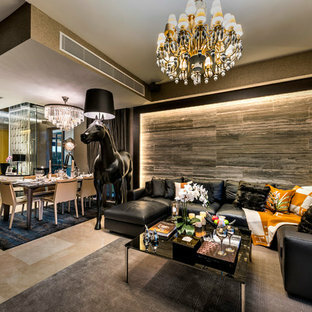 So regardless of current style trends, you should pick elements for that balance between stylish and personal taste. 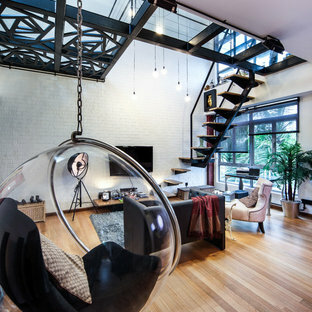 On the whole Singaporeans describe elements of the living room the same way as international Houzz users. However, you may get a wider variety of inspirations by expanding search terms. Or perhaps a greater focus by narrowing word choices. 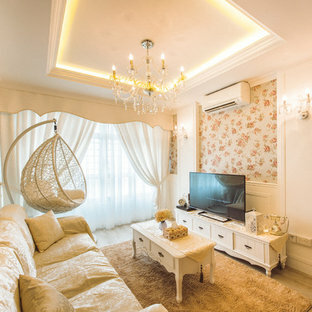 Use the following guide as a breakdown of possible variations for living room search terms used among Singaporeans, and to be aware of the differences between each of them. 1. Living and Family Rooms: What's the Difference? Beyond calling it a living room, the space where a family relaxes and entertains is sometimes called a "family room" in the rest of the world. The living room in a HDB, condo, or landed property is often the biggest room in the house. This is often the space that you'll see first when you step in. 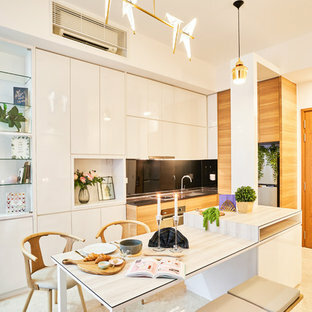 In recent years with the popularity of open-space living room design, the space can also open into the kitchen with minimal barriers. The family room is a much more casual space than the living room, and is not likely the biggest space in the house. Nor would it necessarily be near the kitchen the way a living room would be. 2. Console, Console Table, or Sideboard? Any long, low cabinet for storage can be termed a console or sideboard. They perform the same functions, but are different in name depending on which part of the house they are located in. Internationally, when In the living room, they are often called a sideboard. In the living room, Singaporeans are more likely to use this piece of furniture as a platform and storage for their media (TV cabinet or stand) This would be called console or console table, depending on whether it has storage. 3. Sofa, Chesterfield, Lounge, or Ottoman? Any bench seating for two or more, is a sofa. 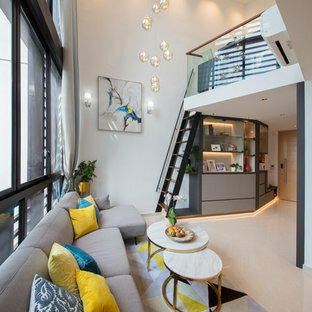 In Singapore, the terms sofa and couch are most commonly used, with the latter being the preferred North American term for this type of furniture. A lounge is traditionally considered a sofa with support for one's legs, but furniture brands have used this term loosely to describe most sofas. A Chesterfield has traditionally had the same meaning as a sofa, especially in the United Kingdom early in the 20th century. Nowadays, it specifically describes a buttoned leather sofa. An ottoman is a seat with no back nor handles. It is often paired up with an armchair as a footstool. As an often overlooked living room seating option in Singapore homes, the ottoman is compact and versatile in the living room. Ottomans with storage can help keep your living room space tidy. Others double up as a side or coffee table too. 4. Coffee Table or Side Table? Most Singaporeans would not have difficulty distinguishing between a coffee table and a side table, as the former is larger and often feature prominently in the heart of a living room space. What we seem to be more concerned, is which would suit our lifestyle. Some have found side tables to be more versatile, than a big coffee table in the middle of their living room. Others feel that a traditional coffee table anchors a living room space, and will not replace it. The proper definition of a carpet is a floor covering that spans the entire rooms from wall-to-wall. They require professionals to install and remove. Rugs only cover a portion of a room, can be easily removed, cleaned and replaced. Because of our tropical environment, rugs are more common in the residential environment, and likely the word you'll be using more often on Houzz. How Do I Use Living Room Inspirations in Ideabooks on Houzz? 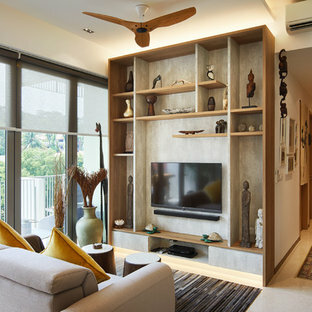 Look up Singapore living rooms ideas on Houzz. 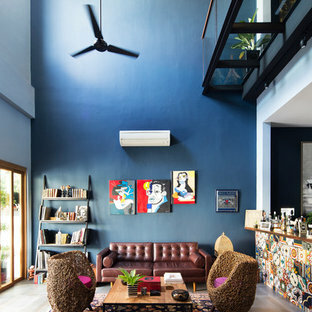 Get a general idea of living rooms, or specifically living rooms that suit your taste, and saving them into an ideabook. Find inspiration for specific items such as the sofa, coffee tables, l-shaped sofas, and start individual ideabooks for them as well. You can then use these ideabooks to budget for your renovation, or have a conversation with a professional like an interior designer or contractor.